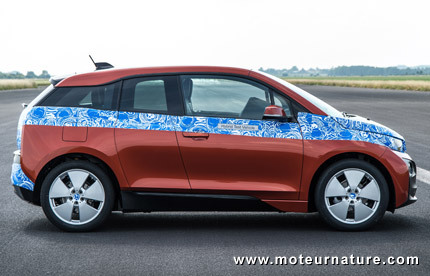 The electric BMW i3 will be officially unveiled at the end of the month. As most technical details have already been revealed, the biggest question was about its price. BMW has never sold an EV before, and the brand is not known for budget pricing. Many people were expecting the worse, but official pricing is a huge relief. At €34,950 in Germany and $41,350 in the U.S. (without incentives), the BMW i3 is not cheap but definitely competitive. The base Nissan Leaf is €29,690 in Germany, but the i3 will carry the much loved BMW badge, more tech with lots of carbon fiber, and is much faster, going 0 to 62 mph in 7.2 seconds, when the Leaf requires 11.5 s.
Congratulations to BMW for bringing to the market a sporty EV at a quite affordable price!